Theater Premiere. Los Angeles. 1955. Danziger Gallery is pleased to present the first exhibition of Robert Frank photographs from the Pennwick Foundation Collection. Selected from a group of over 1,000 prints acquired in 1978, the works are part of one of the earliest and most comprehensive collections of this most important figure in the history of the medium, focusing on the seminal images created by Frank in London, Paris, and America from 1949 to 1962. Robert Frank was born in Zurich in 1924. He began his career in photography in the mid-1940s before emigrating to America in 1947. There his bold photographs brought him to the attention of the legendary art director of Harper's Bazaar, Alexey Brodovich, and Frank was hired as a roving fashion photographer. The job allowed Frank to travel back and forth to Europe where he produced two significant bodies of work – one his Paris pictures and the other photographs of England and Wales. These pictures were an essential forerunner to Frank's American work as well as significant works in their own right. As an immigrant, Frank was fascinated by America and after his first travels around the country he applied for a Guggenheim Fellowship which he was awarded in 1955. He then embarked on a two year trip across America during which he took over 28,000 photographs. Eighty-three of the images were subsequently published in the book "The Americans" - generally acknowledged to be one of the greatest photography books ever published. What Frank brought to the medium was an improvisational quality coupled with a subjectively original but objective point of view. He saw the world in a way that was at odds with commonly perceived visual clichés of his time but which was certainly more truthful. While the darkness and idiosyncratic nature of much of his vision at first shocked many people – it became the template for much of what was to follow in photography. By the 1960s Frank had largely turned his attention to film not returning to still photo-graphy until the 1970s – at which point his work became much more autobiographical, combining text, multiple frames, and deliberately scratched images. Today Frank lives and works quietly in New York and Nova Scotia while interest in his work flourishes. 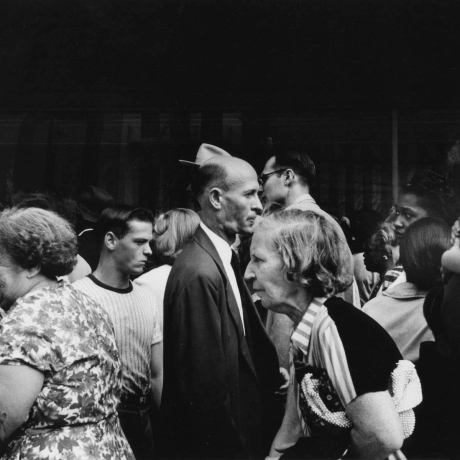 The most recent major show – "Looking in: Robert Frank's The Americans" opened at the National Gallery in Washington D.C. in 2009 and continues to travel to major museums around the world. His last solo gallery show was at Pace MacGill in 2009. The Pennwick Foundation is a not-for-profit organization dedicated to broadening public awareness of art. In addition to publishing books, catalogs, and electronic media on topics including but not limited to painting, photography, and film, The Pennwick Foundation seeks to create educational opportunities and increase access to the arts through the development of new methodologies of exhibition.